PhD student, Lee Chee Leong, from the School of Arts and Social Sciences, shares his experiences and opportunities upon receiving the Chinese Government Scholarship (Bilateral Program-Malaysia). When the Chinese Premier, Li Keqiang, pledged that China would offer 50 scholarships for Malaysian applicants at the 18th ASEAN-China Summit in November 2015, I never would have thought that I would be a recipient of one of the coveted Chinese Government Scholarships (Bilateral Program-Malaysia) to conduct fieldwork for nine months in Nanning city, Guangxi Zhuang Autonomous Region (GZAR or Guangxi). As a current PhD student with sights set on pursuing an academic career, it was very encouraging and rewarding. To make it sweeter, I was also admitted as Visiting Senior Scholar in the School of Politics and Public Administration, Guangxi University for Nationalities (GXUN). My visiting fellowship in Nanning allowed me the rare opportunity to research the unique division of powers between the Chinese central government and provincial governments. I was looking into aspects of how Guangxi influenced the trajectory of cooperation between ASEAN countries and China. With the autonomous region being the subject of my study, my stay in Nanning allowed me the chance to participate in the high-level China-ASEAN Expo (CAEXPO) and the Pan-Beibu Gulf (PBG) Economic Cooperation Forum. My stay also helped me secure local documents from the public archives, which were extremely crucial for my research. Ample opportunities were given to meet and engage with those involved in constructing the ‘Guangxi Channel’ to ASEAN-China cooperation. I spoke to GZAR’s officials, university administrators, research fellows from local think tanks, and even business representatives. During my fellowship, I was invited to the neighbouring provinces of Guangdong and Guizhou. It was in Guangdong where I was invited to share my views on Malaysia-China relations in an upcoming academic conference. I am very much looking forward to it, as it means that I would be able to gain insights into the involvement of the Guangdong provincial government in the Melaka Gateway project. In Guiyang, the city of Guizhou Province, I met with local officials, to discuss ways to improve the overall ASEAN-China education cooperation via the ‘Guizhou Channel’. For an aspiring academic, these engagements with counterparts in China were definitely invaluable as it provides the basis for future academic collaborations. 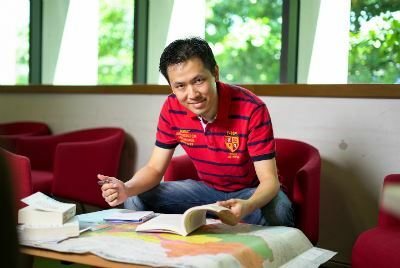 Chee Leong, 36, currently pursues his PhD - Doctor of Philosophy - at Monash University Malaysia.